One of the 31 cats pictured on a faeces-covered floor under a bed. A couple who kept 31 cats and a puppy in their faeces and urine-covered Boston home have been banned from keeping animals for six years. Simon Franoux and Lisa Clarke now of The Limes, Melksham, Wiltshire, formerly of Woodthorpe Avenue, Boston, were sentenced at Lincoln Magistrates Court on January 19. 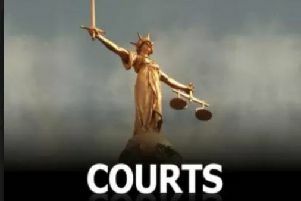 Clark, 44, and Franoux, 56, had been found guilty of causing unneccesary suffering to the animals at an earlier hearing at Skegness on November 27, 2014. As well as both receiving a 12-week sentence, suspended for 12 months, they were also disqualified from keeping all animals for six years and made to pay £280 costs each. The court heard how the RSPCA was called in October, 2014, following a tip-off from a member of the public regarding concerns about a number of animals living at their former address. RSPCA inspectors removed 31 cats and one black labrador puppy from the property as they were suffering from cat flu and respiratory illnesses along with flea and ear mite infestations. The court found that all the animals were suffering as a result of the conditions in which they were confined to. RSPCA inspector Sarah Chambers said: “This was a grim case. The property was a two-bedroom bungalow, there were no litter trays present and it was covered in animal faeces and urine. Two of the cats had to be put down by a vet due to their health conditions – but the RSPCA says the rest, including the dog, have all now been re-homed. l To report animal cruelty call the RSPCA on 0300 1234 999.